First, we will create a design in Photoshop and then code the site. You will also learn to build a great countdown timer and at the end we provide you with some great guidelines for building useful coming soon page, with examples of course. Check the table of contents and scroll to your interests. Create a new document 1020 pixels width and 700 high. This size is great for coming soon/error and other similar pages. Make the background a light grey and apply some noise to it (Filter->Noise->Add Noise). Create a 700×400 pixel white shape. Set the Fill to zero and apply any seamless (transparent) pattern. Use Helvetica in two weights (regular and bold) and two sizes (30 and 12pt) place two catch phrases/slogans. The best thing is to write down some info that will describe your upcoming website. By using 12px lowercase Helvetica and icons from the IconSweets2 set, create two horizontal groups of elements. Each element must consist of one icon and one link. I’ll set it with three elements for each row. We move on to creating one of the most important elements in a coming soon page, a countdown counter. By using the Rounded Rectangle Tool (U), create a shape of 140×140 pixels. Apply a Drop Shadow with 15% of opacity. Apply some Inner Shadow. Even if the shape looks blurry at the moment, the Inner Shadow will be visible when we finish the shape. Add a Gradient Overlay effect with the blend mode set to: Soft Light and 55% opacity. Finish the shape by adding a stroke. Set the Fill Type to Gradient and the Angle to 90 degrees. By using the League Gothic font, 92px, input a random number. This will show the number of remaining days until the website launch. Apply some Drop Shadow to the text and numbers. Duplicate these boxes three times and place them accordingly. By using the Elipse Tool (U), you can create small dark circles which would work as dividers for the boxes. Under the countdown widget we will be creating an input form. It will allow visitors to input their email so they can be notified when the site launches. Create the form by using the Rounded Rectangle Tool. Set its color as gray and apply some inner shadow effect. Apply a Gradient Overlay effect. Apply the same blend mode, with an opacity of 20%. Finish the form by adding a gray stroke. We’ll have to finish our “subscribe” widget by adding a button which would submit the information in the form. By using the Rounded Rectangle Tool (U), create a shape which will be the base of our button. Apply some inner shadow effect. We can apply a nice touch to our button by using a bit of Bevel and emboss. This will make the second half of our button a little bit darker, a pretty nice effect. Set the size to 2px, set the opacity for white to zero% and set the opacity for gray to 15%. Apply the same Soft Light Gradient Overlay effect we’ve been using for various elements in this layout. Finish it by applying a stroke effect, with some really dark gray colors. By using the Type Tool and Helvetica font, input some text on the button. Under the button we will place a few social media icons. I grabbed mine from the IconSweets2 icon set. Gave them a really nice bright color. To achieve the “handwritten” effect, we will be using the Journal font. To bend that line, you will have to create a slash and apply the Warp Text feature with an Arc. It is a lot easier than you can imagine, and it will take you only a couple of seconds to achieve that effect. As you can see, the page contains a lot of gradients and shadows. We will create them using just CSS3. As you may know, CSS3 provides a lot of new properties that let us create cool effects without the need of using images. For the countdown timer we will use jQuery and the jQuery countdown plugin from tutorialzine.com. Of course we will customize it a bit to match our design. In this tutorial we will also use some new HTML5 tags (and make them work on Internet Explorer 7 and 8) and some interesting attributes like “placeholder” and “required” for the subscription form. The “placeholder” attribute lets us show text inside the email input field when it’s empty, while the “required” attribute lets us define the email input field as required, so the user cannot submit the form without entering their email. We will also provide a jQuery fallback for these two attributes, for older browsers and for browsers that don’t support them yet. So, enough talking and let’s begin. fonts – the fonts’ folder, will contain the font that we will use for the timer. The body of our page is also simple. It contains the header, where we will put the headline and the page’s description; and the “main” div where we will put the links, the countdown timer, the subscription form and the footer. 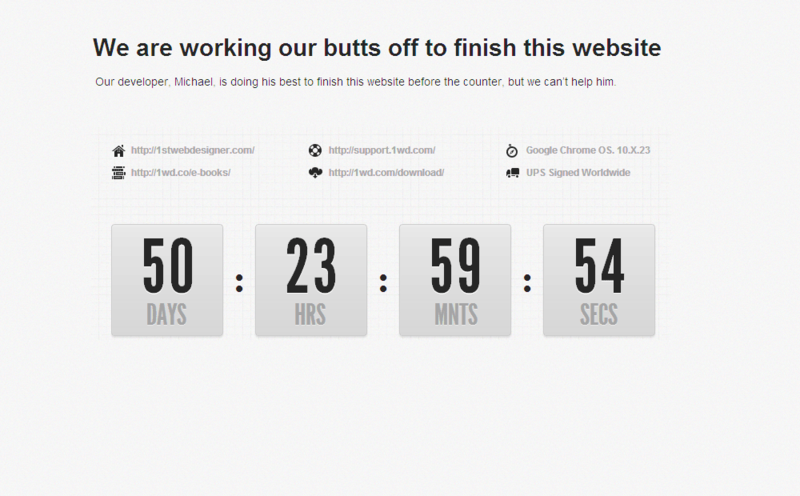 Our developer, Michael, is doing his best to finish this website before the counter, but we can’t help him. The main area of the page is contained in the “main” div as you can see in the HTML code above. This area will contain the links, the timer, the subscription form, the footer and the social media arrow. It has a width of 700 pixels, it’s center aligned and has a repeated grid pattern as background. It also has a relative position. We will need this line for giving an absolute position to the social media arrow, as you will see below. The links area has a width of 700 pixels and each link has its own icon. Then we play a little bit with margins and padding to make them match the PSD design. We also use a relative position for the links so later we can add a simple animation to them with jQuery. Depending on the time that we set when we initialize the counter, the plugin will show the right numbers on the four boxes (“DAYS”, “HOURS”, “MINUTES”, “SECONDS”) and animate the timer. Note: I will not explain the plugin in detail here. Martin Angelov, the creator of this plugin, did a pretty good job on explaining how it works. You can check it out on tutorialzine here. Here we have used the “League Gothic” font that you will find in the source files. If you want to use this font on your designs, you can download it here. As you can see, we have used only CSS3 properties for creating shadows and gradients. These new properties lets us create complex designs without the need of slicing images. This way our pages are very lightweight and we can save a lot of time. The CSS3 properties used here are: “border-radius”, “box-shadow”, “linear-gradient” and “text-shadow”. You can easily understand what these properties do by just reading their name. We have also used the “rgba” attribute that is very interesting and convenient because it lets us assign transparent colors to the various CSS properties. We have a text input field for collecting the user’s email and a submit button. The text field is required so the user must fill it with an email address before submitting the form. When it’s empty, it shows the text “Input your e-mail address here…”. We have used the CSS pseudo-classes :hover, :focus and :active for changing the style of the input field and submit button when the user enters his email, hovers over the button or clicks on it. We have also used the same CSS3 properties that we used for the countdown timer, “border-radius”, “box-shadow”, “linear-gradient” and “text-shadow”. We defined the text input field as required so the browser doesn’t allow the form to be submitted if the user leaves the field empty. These two new HTML5 attributes (“placeholder” and “required”) are very useful and can save us a lot of time, but they aren’t supported by older browsers like Internet Explorer 7 and 8. Another problem that we have here appears when we use the Safari browser. Safari doesn’t support the “required” attribute, but Modernizr returns “true” when checking if this feature is supported. So, we have to check if the browser doesn’t support the new attributes and if the browser is Safari. If so, we have to provide a jQuery fallback for showing the placeholder text and for detecting if the text input field is left empty and show a warning popup if it is. You can note how we added a new paragraph that contains the text “Please fill out this field.” to the form and we assigned to it the class “popup”. On the footer part of our Coming Soon page we will add some icons that will link to our social media accounts. Since Internet Explorer 7 and 8 don’t support the new CSS3 properties, the gradients and shadows will not be visible on these browsers, but the page will still be usable. Also, thanks to the jQuery fallback that we have created, the subscription form will work fine. This is because on IE 7 and 8 the text in the input field doesn’t align (vertically) in the center. Finally we did it! We created our Coming Soon page and we’re ready to use it on our site. We used some new CSS3 properties and some new HTML5 tags and attributes that saved us a lot of time and made our page fast and lightweight. So, what do you think about this tutorial? Did you learn something new? Also, what do you think about these new properties? Will you use them? Or maybe you want to wait until they are better supported by the different browsers? In the next section we will be concentrating on countdown timer. We have already a beautiful coming soon page. The next tutorial is another version of the above one. We really want to give you some great alternatives. A website that is not yet ready to be launched needs a “Coming Soon” Page to notify the visitors that it would be soon launched on a specific time frame. As the modern web development evolved, this page is more than just a simple text page or an under construction image. Designing the “Coming Soon” page increases the level of expectation of the visitors, thus, giving them the thrill of what will be soon published on the site. Aside from the design, you can also collect information of interested users by inserting a “Notify Me” textbox and a “Subscription Button” on the page. For our markup, we’re going to wrap everything into a class container which will hold all of our elements. This will include header and section elements that will hold our basic tags with their respective IDs and classes. We will also include a simple footer element which will contain our copyright text. Notice that we used the ID counter before the “Notify Me” form. This will hold our counter and will be used by our jQuery code. 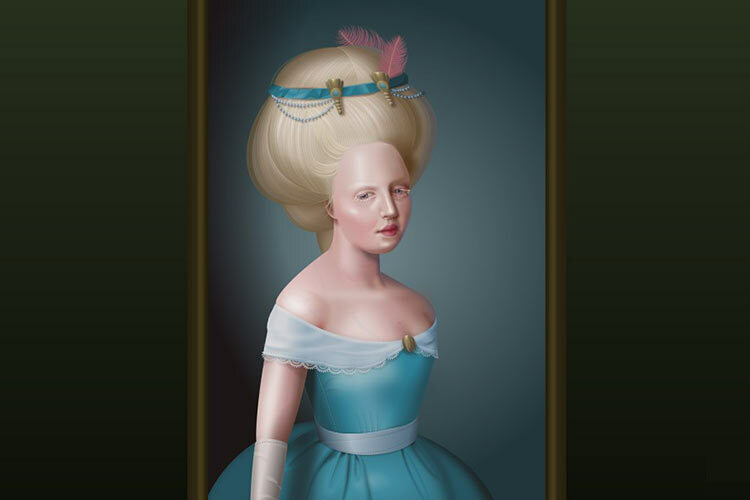 We will also style this later on style.css file. By this time, you will have same output like the image below. For our CSS file, we’re going to add styles first on our basic elements such as the body, H1, H2 and the container class. The container class will have a width in the form of percentage to create a responsive effect. Notice that the CSS3 transform property was used on the H1 tag, the title tag. This will enable our title tag to rotate 360 degrees on the x-axis position. To learn more about this you can check this resource. Next, let’s put a basic style to our forms. This will add basic styles on our text box and button. Our next target will be the placeholder for our text box. Vendor prefixes will be used to target specific browsers styles. After styling the placeholder, let’s now move to our counter. If you remember, the counter ID was used to specify the position of the counter on the markup. Now, to style the counter, you will be using the default classes of the jQuery Countdown plugin countdown_section and countdown_amount. count_section will hold the label of counter (e.g. days, hours, minutes, seconds) while the countdown_amount will hold the numeric value of the counter. To divide each section, choose a border dashed with a 1px width and the color of white. Next, let’s add further styles to the “Notify Me Form” section. Add a maximum width of 610px for this section and set the position to relative. Align the Submit button to right side of the text box and give it a position absolute. Finally, add some basic style to our footer element. To make the whole site responsive, add media queries to style specific elements on different view ports. If you want to learn how media queries work, you can check here. If you are going to check the output on your browser. You will get similar results like the image below. Notice that the counter is not yet showing on the page. 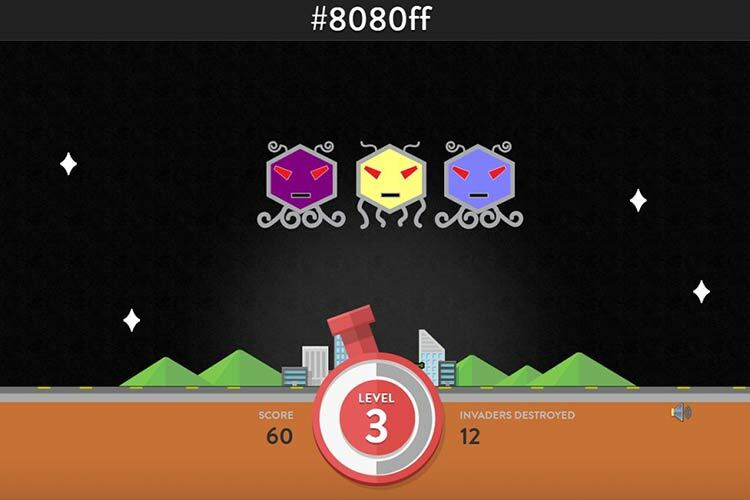 To make it appear, add our jQuery codes before the closing body tag. First, load our jQuery Countdown plugin by specifying the link of the script. Next, add the following code to display our counter. Copy the code below under the script link of our jQuery countdown plugin. In the code below, a variable launchdate to hold and to instantiate a new date was used. You can change the launch date according to the date you want it to be set (according to YYYY,M-1,D calendar format). Just take note that months range from 0 -11 like an array setup and then subtract it to 1. For this example, the launch date of the site will be on June 7, 2014. Finally use the ID counter to call our launchdate variable. Congratulations! You just created a fantastic “Coming Soon” page with counter. When visitors land on coming soon page, usually they’re not coming back again to check the page, especially if doesn’t have enough information about the site or the launch date. Adding a counter will make inform them about the date wherein they can check the site live. A Coming Soon page, when created properly, will loop visitors by getting them to subscribe to the news update and will keep on coming back. Hope you enjoyed this tutorial and see you again next time. If you completed the both tutorials you now have a pretty solid knowledge on how to build coming soon page. However in the next section there are some great guidelines on how to build an useful one.